November and the nights are getting longer and darker. With these chillier evenings, we often get lovely clear dark skies with plenty of stars, all looking as if they are stuck to some heavenly backcloth. Actually, unlike the ancient Greeks, who gave most of the constellations their names, we know that the stars are not all in one great “shell” around us but vary enormously in distance. 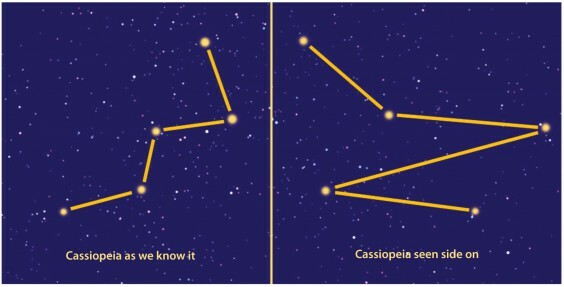 Take, for example, Cassiopeia, easily spotted right now, halfway up the sky in the northeast, in the glow from Birmingham. It forms a wonky “W” with all the stars at similar distances from each other. But, are they all the same distance from us? Rather than start using terms that sound like they’re from a science fiction movie, like “light years” or “parsecs”, to indicate how far away they are, let’s find a way of trying to visualise distances. Imagine standing in the middle of The Square in Alvechurch, halfway between the dentist’s and the chemist’s. I say imagine because it would be a silly thing to do unless you were there on New Year’s Day watching the Morris Men. . . er, no, let’s just imagine. Now, with Cassiopeia standing on one end, let’s start with the very top star or the right hand end of the W. It is called Caph and on the scale we are about to use, it would be just at the entrance to the Village Hall. Next one down is Shedir and it’s sitting in the pavilion at the cricket ground. The third star down has no name (ahhh) so is sulking under the canal bridge by the Crown. The next one down is Ruchbah and it’s in the bar of the Red Lion. Finally, at the bottom is another unnamed star sitting at the entrance to the railway station. So you see, the stars that look like they’re all in a flat plane are really nowhere near each other. There are more extreme examples too. If you turn to face the southwest, high above your head is a cross of stars forming Cygnus, The Swan. At the head of the cross is the bright star Deneb. Over to the right is the brightest star in this part of the sky, Vega in Lyra. Halfway down the sky is another bright star, Altair in Aquila. These three form the Summer Triangle to which I have often referred. Being all of similar brightness, you would assume they are of similar distances. Starting at the bottom with Altair, it is the nearest of all the stars we can see and on our scale it is just at the far end of the counter in Crow’s the butchers. Vega, the brightest, is a bit further away, just outside The Lounge. Deneb is, however, a different kettle of fish. It is one of the most distant stars and is just about at the door of the Hopwood House. Actually, the star at the centre of the cross, Sadr, is even further, halfway up Hopwood Hill. So, while you’re out on the 17th looking for the shooting stars of the Leonid meteor shower, take a moment to try to visualise the real positions of the stars. Incidentally, if you’re wondering how far away our Sun is on this scale, it is too tiny to even see – a bit like me!